The beautiful temple of Prasat Phra Wihan is in the news again after being out of it for many decades. 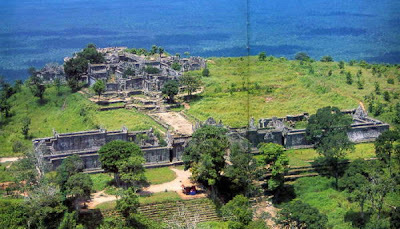 Popularly called Preah Vihear, this ancient temple is located right on the border between Cambodia and Thailand and the two countries have been at odds over it since the French separated Cambodia from Thailand in the early 1900’s. If you are ever in that part of Thailand make a point of going to see it. Getting there from the Cambodian side is far too difficult and dangerous. Believe me! I know. It sits on the top of a high hill – one side with a gradual slope and the other side ending in a most dramatic cliff. An incredibly impressive stairway in three tires with 214 steps leads up the slope and the entire complex extends for over 800 meters. In 1962 Cambodia and Thailand took their dispute over the temple to the International Court of Justice and judgment was returned for Cambodia. Ever the sore losers, the Thais have never really accepted this judgment and every now and then a politician who wants to make a name for himself will bring up the issue of the temple’s ownership. The Thais like to think of themselves rather than the Cambodians as the decedents of the Khmers (We built Ankor Wat!) and never let history stand in the way of a bit of chauvinism. Just to make sure there is no doubt about who owns Prasat Phra Wihan, the Cambodians have put a picture of it one their 100 riel bank note. Cambodia recently applied to have Prasat Phra Wihan given World Heritage status, the present Thai government agreed to support their bid but last week the Thai High Court, probably egged on by those trying to embarrass the prime minister, blocked the government from doing so. Prasat Phra Wihan could act, quite literally, as a bridge between the two Buddhist neighbors. Instead it continues to be a barrier. My photos of the temple have turned yellow with age so I provide this aerial picture of it. I am going to be in Australia for a conference until the 15th so no new postings until then. ... Thai military officials said soldiers had been deployed on Thai territory nearby "to protect our sovereignty".